Meyer lemons are rounder and smaller than regular lemons and have a taste that is like a mix between a lemon and mandarin oranges. I'm a lemon lover who enjoys eating lemons, even the peel appeals to me 😉 See what I did there? If you aren't zesting lemons you haven't started eating yet! Please buy a zester and get zesting! 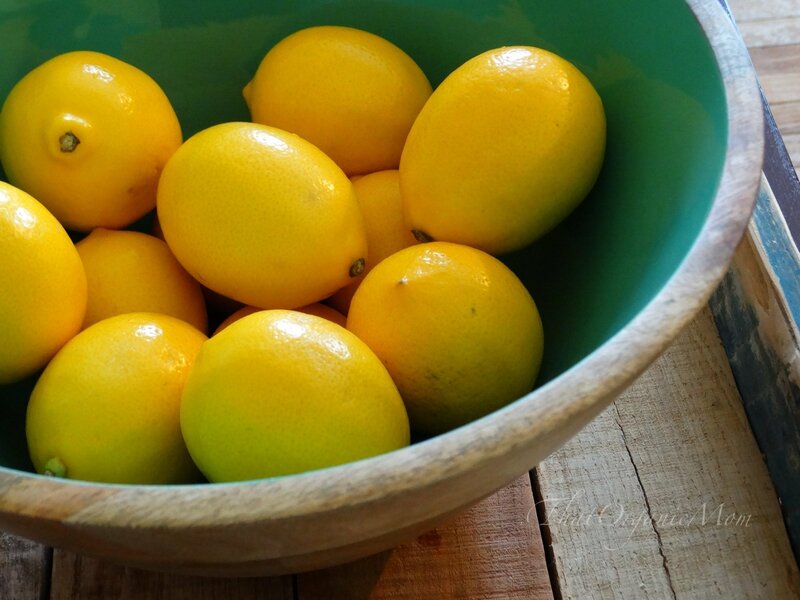 Particularly, Meyer lemons have a fragrant and beautiful tasting zest. 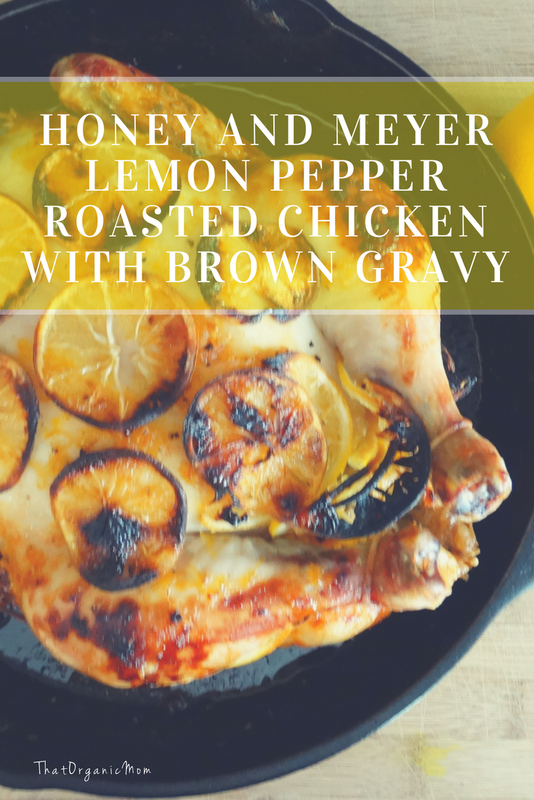 So lemon pepper chicken isn't new but this recipe is really outstanding and unique. Want to impress your guests, try this one! 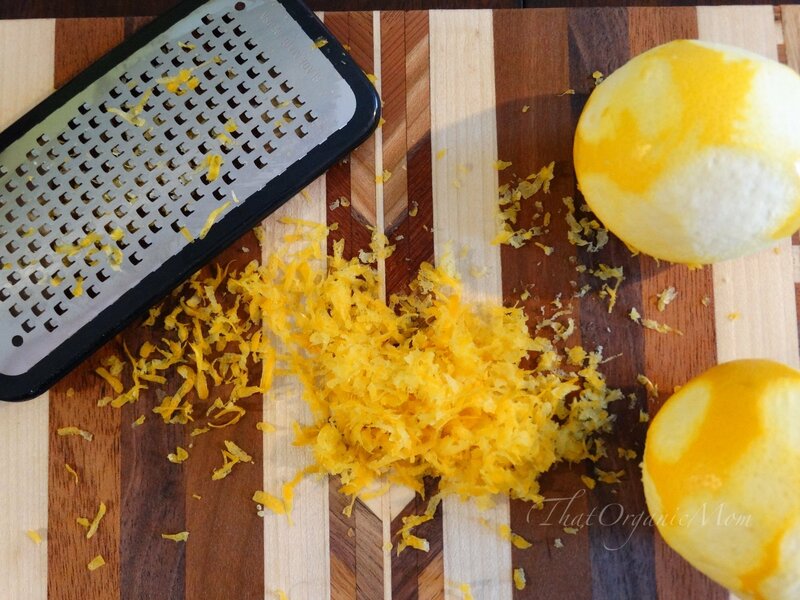 If you aren't zesting Meyer Lemons you haven't started eating! 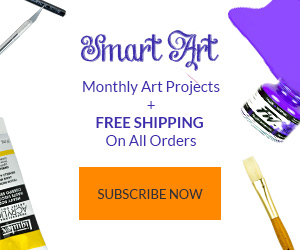 To get started, there's very little prep. 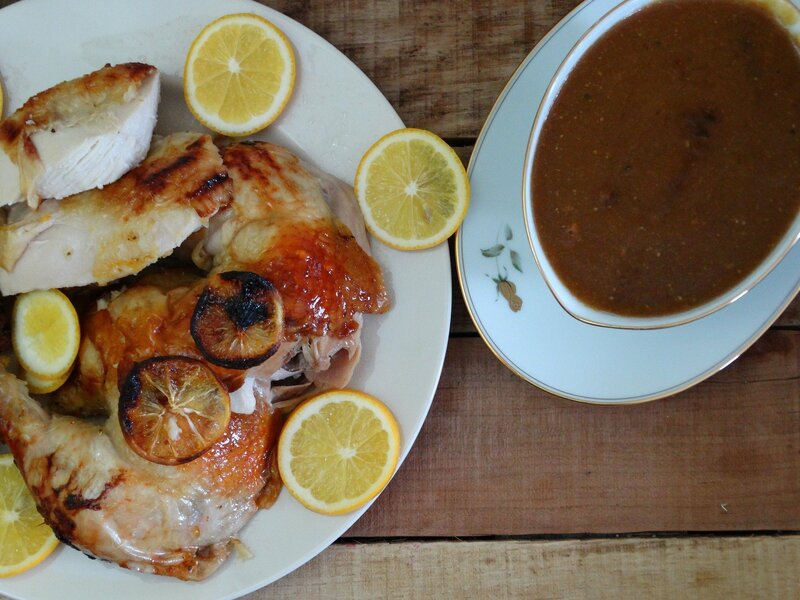 Just prepare the mixture with a few ingredients and pour over the chicken, top with lemon slices and bake! It's really very simple yet it looks like you spent hours in the kitchen. Now, if you want to make the gravy and you've never tried it before my one tip is: keep stirring. That's the key to a good gravy, don't let it cook too fast and get clumpy by stirring constantly. This optional gravy is made with the goods left in the skillet, some flour (gluten-free or regular), and broth. Easy! 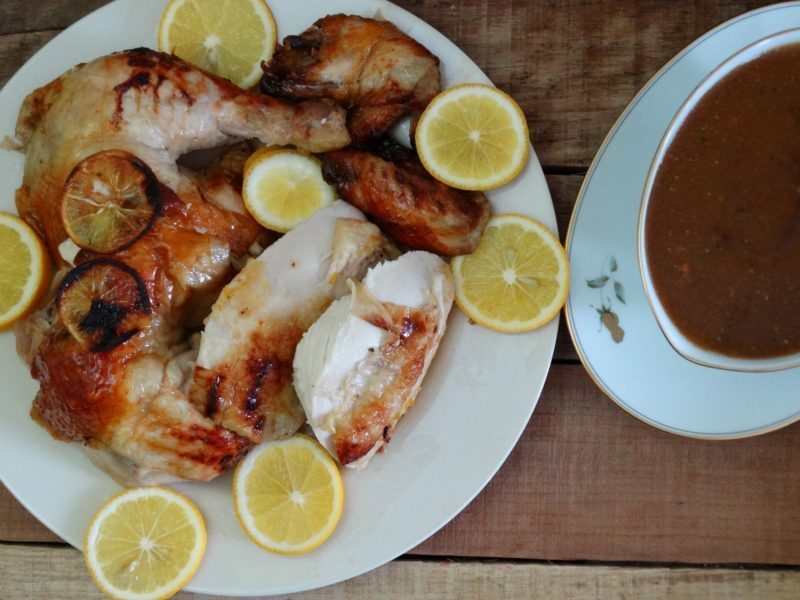 Use whatever baking dish you have to cook your Honey and Meyer Lemon Pepper Roasted Chicken. I like to use an iron skillet because it's a perfect fit, ease of use, extra iron it imparts to foods and of course the searing factor. Plus, after you remove the chicken, you can make the gravy right in the same pan for easy cleanup. 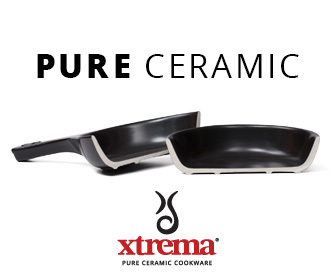 Might be my imagination but seems like it makes food taste just a little better in a skillet than other baking dishes. In the past, my chickens were all willy nilly while roasting, as I had never trussed a chicken before. I do it every time now that I learned how and you can too, it's really not that hard. Just go to YouTube and search for “truss a chicken” and get educated! That's how I learned. Thanks, Martha! Hopefully, you can get your hands on some Meyer Lemons, they are in seasons from November through March. While they are in season I use them every day! Trader Joe's carries them and most health food store chains should have them as well. Always make sure you cook your chicken to 165 degrees by using a meat thermometer. I can't recommend this one highly enough! Find my other kitchen recommendations on my Amazon Kitchen List. The leftovers from this chicken, if there are any, taste fantastic on top of a Caesar Salad, or any salad really. Also, the leftovers can be made into a nice chicken salad with a citrusy flair or use them for this Chicken and Pear Arugula Salad. Zest 2 of the lemons, then juice reserving both zest and juice. Mix the juice, zest, honey, oil, pepper, garlic, and salt together in a small bowl. Dry and truss chicken, then salt well. Preheat skillet with just a bit of oil in the bottom. 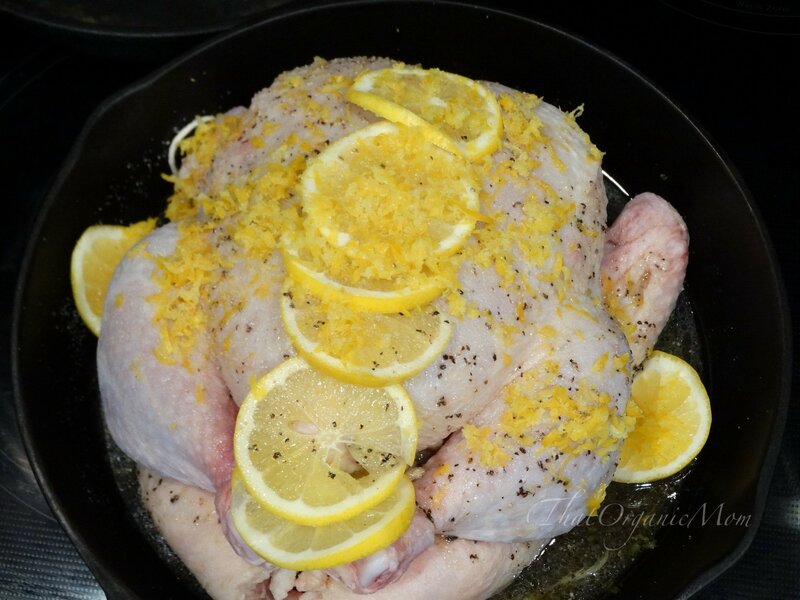 Put chicken in skillet, pour mixture over chicken and place slices of 3rd lemon on top. Let rest 10 minutes after removing from oven. 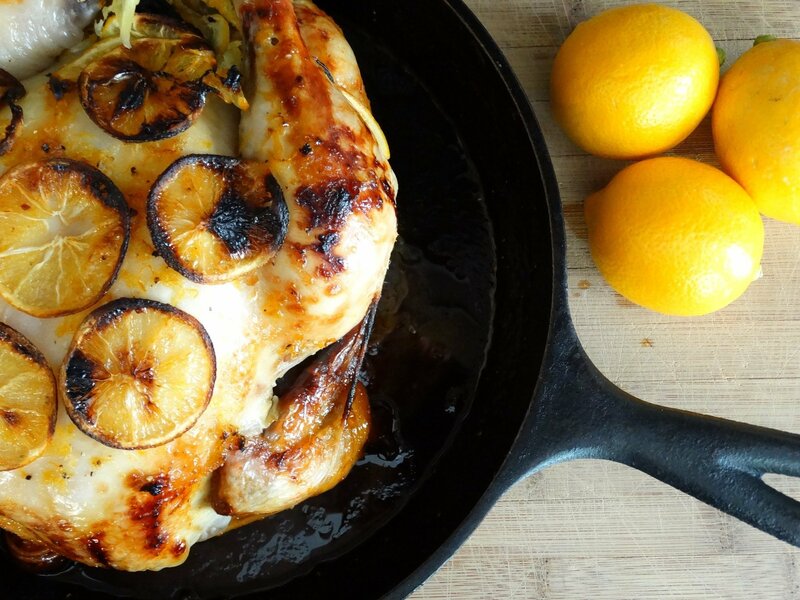 Remove chicken from skillet onto a carving board to carve. Heat liquids left in skillet over medium heat, add 2 tbsp flour stirring to combine well, continue stirring as it thickens, when you have a rue, slowly add broth while whisking carefully until your gravy thickens up to the desired consistency. A meat thermometer takes the guesswork out of cooking meat, I can't recommend one highly enough. For gluten free gravy, use rice flour in the rue. I hope you'll give this recipe a try and also, take a second to pin this to your healthy eating boards! Previous Post: « Wrinkles Schminkles; you look gorgeous girl!